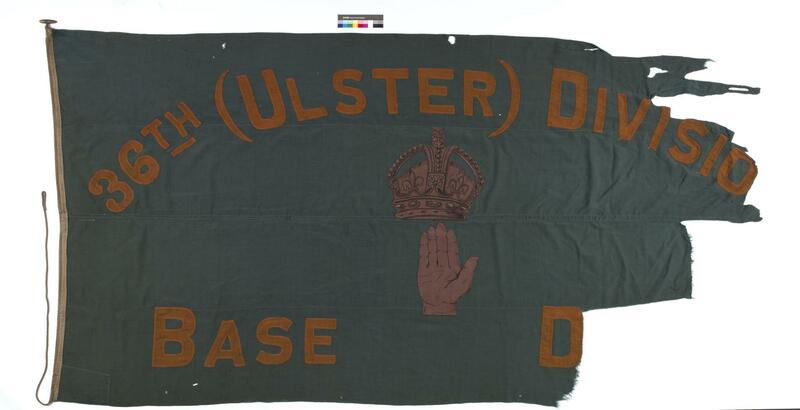 36th Ulster Division Flag. In the centre the Hand of Ulster surmounted by a crown. Above sewn on in orange cloth "36th (ULSTER) DIVISION". Below "BASE DEPOT." In September 1914, the Ulster Division was formed from the Ulster Volunteer Force which raised thirteen battalions for the three Irish regiments based in Ulster: the Royal Inniskilling Fusiliers, the Royal Irish Fusiliers and the Royal Irish Rifles. The Great War cost 36th (Ulster) Division 32,186 men killed, wounded or missing.